Last week, I found this image on Pinterest from Highstreetmarket.blogspot.com. Am in love with this vignette! Dark deep indigo wall, vintage nautical oil painting, bamboo folding bar table, and an assortment of beautiful barware. I simply love the how the gold painted frame just stands attention against the rich blue, don't you? 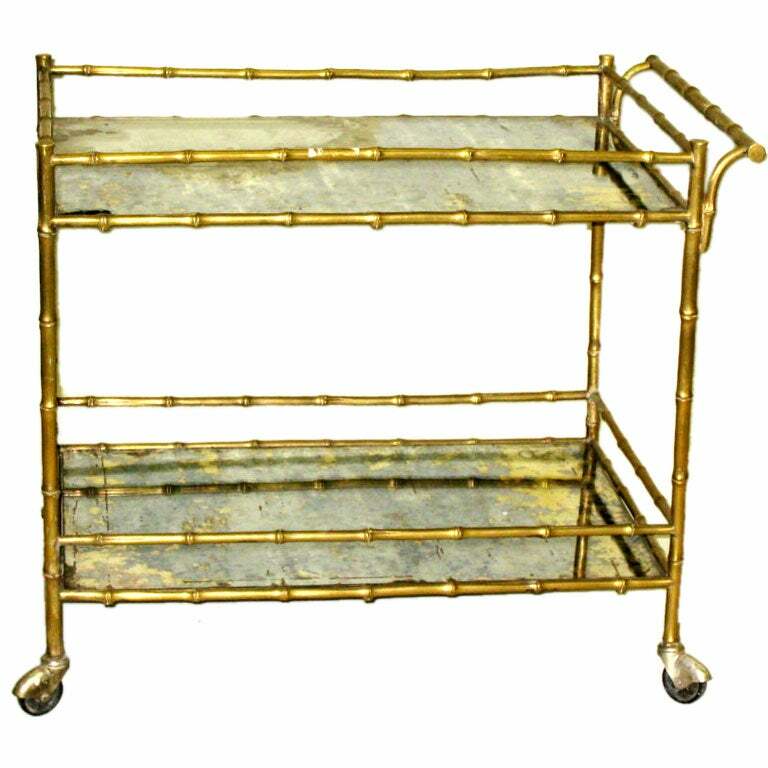 Ideally, I think I want a vintage bamboo butler tray table. 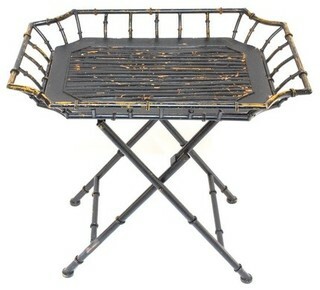 You know something like this one from that dangerous website, 1stdibs.com . I could spend all day drooling scrolling through their vintage furniture listings! Then I would need an interesting nautical, coastal lamp....maybe like this "Regatta" style? or a simple clear glass and a pretty white linen shade? Love this pretty Oscar lamp from Currey & Co. with its' recycled glass base and brass accents - perfect for nautical styling! 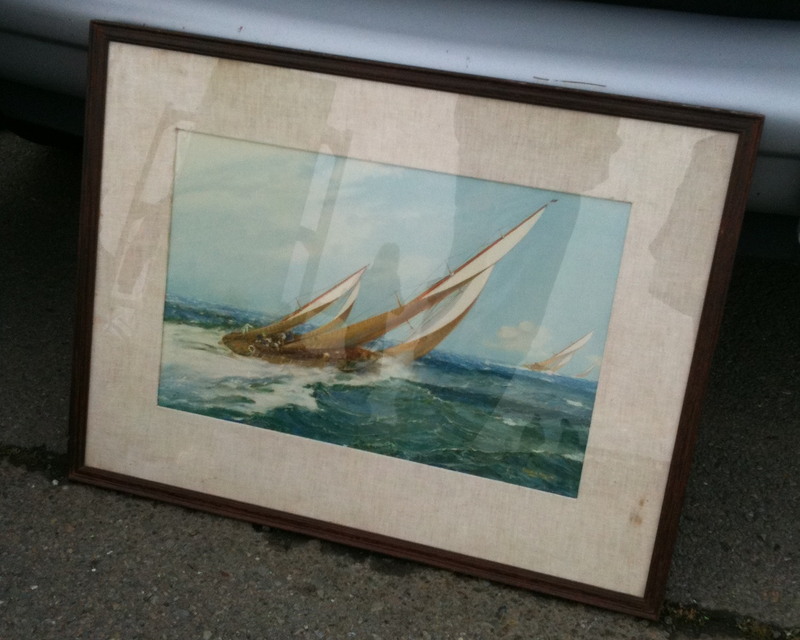 And now for a vintage nautical oil painting. There are two places that I would look first. 1. My friends at Cuttysark in Pioneer Square in Seattle. 2. The Alameda Flea Market is LOADED with vintage nautical paintings and prints. 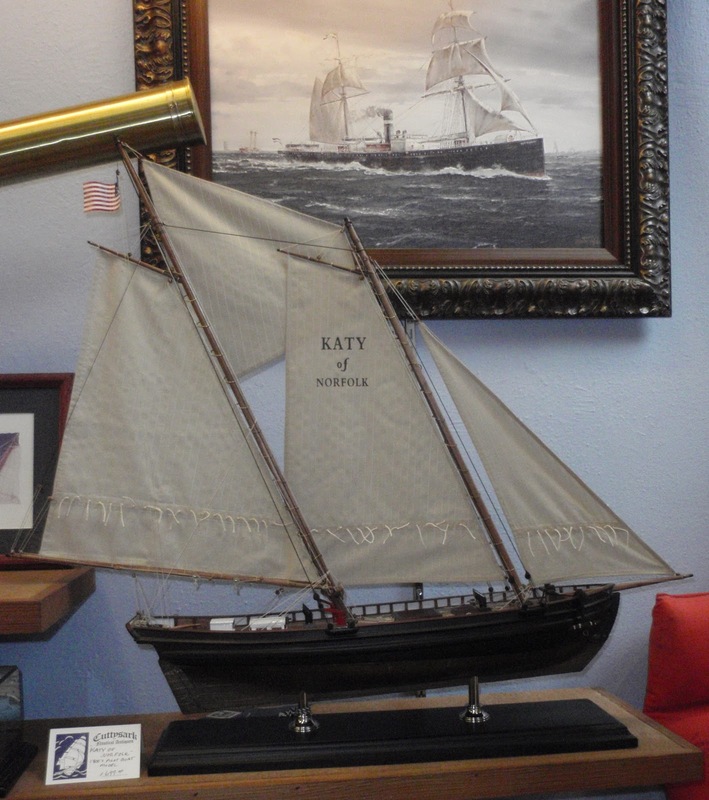 Here's also just one image that I caught at the Alameda Flea Market last spring. Any vintage or thrift shop might turn up a real find too! And now, to choose the cocktail glasses. 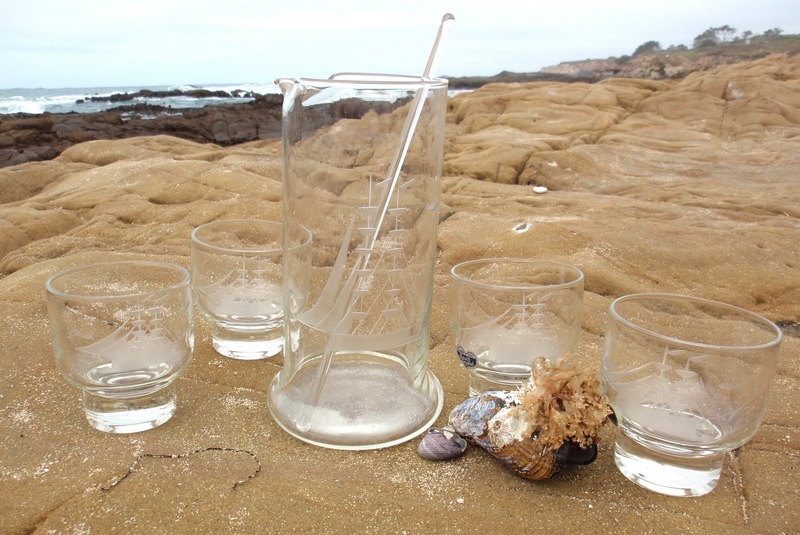 I have a thing about vintage glassware. It's kind of a problem.... bought these etched sailing ship glasses over a year ago at the Alameda Flea Market, and just can't bring myself to part with them. Hmmmm... maybe that means that they need to go on my new bar? 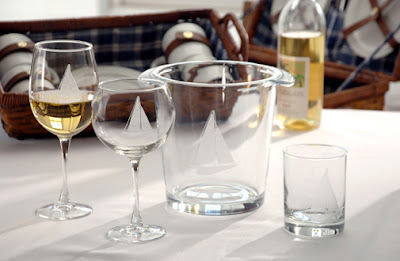 Or, new nautical style cocktail glasses are always an option! P.S. 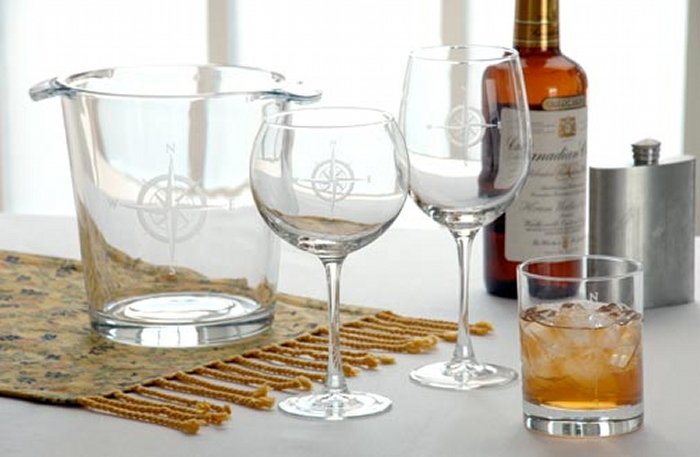 Yes, you can find the glasses on our site! 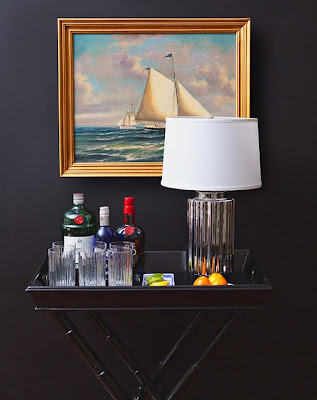 Maybe one final touch to complete your nautical bar - a cocktail napkin box! Have a great weekend everyone! I have promised Tom a day-trip up to Tomales Bay, or maybe even Bodega Bay for oysters. We'll probably go to Nick's, in Marshall and sit at their oyster bar, staring out over the view. Tom will get fresh oysters, I will get the crab bisque. Yum. I'm going to have to add that Pinterest picture to my It must be 5 o'clock somewhere board. I Love it! I love all of your beachy ideas! My weekly Pinterest linky party is on now so please pop by if you have 5 minutes. I would be honoured if you could link up this post! 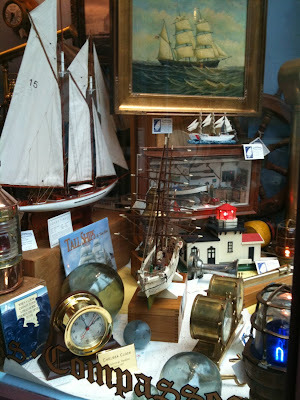 I'm going to try to up anchor and go to the Alameda Fair December 3 - oops no, that's the day of the Remodelista Market in Larkspur Landing! How is a girl to choose? I'm totally in love with those bubble lamps that you sell - gorgeous! I also love your new blog header...keep up the great work. Happy Thanksgiving to you & the family.